Definition at line 67 of file octet.h. Definition at line 359 of file octet.h. Enum for setting the hex output format. Definition at line 74 of file octet.h. Constructs a valid OctetStr with zero length. Constructs a OctetStr with the given value. The OctetStr will be valid unless a call to new fails. Construct a OctetStr from another OctetStr. Null out the contents of the string. Pointer to the newly created object (allocated through new). Definition at line 242 of file octet.h. Get a pointer to internal data. Definition at line 315 of file octet.h. Build an OctetStr from a hex string. Called with "5465 737469 6e672074686973206D657468 6f 64 21" the returned value will be "Testing this method!" Get a printable ASCII value of the string. Depending on the selected output format, this method will return get_printable_hex() or get_printable_clear() if the string contains not printable characters. Get the contents with all non printable characters replaced. Get an ASCII formatted hex dump of the contents. This method always returns sNMP_SYNTAX_OCTETS. Definition at line 225 of file octet.h. Definition at line 310 of file octet.h. Append a char string to this OctetStr. Append a single char to this OctetStr. Append another OctetStr to this OctetStr. Assign a char string to a OctetStr. Assign a OctetStr to a OctetStr. 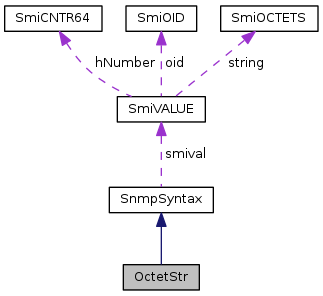 Map other SnmpSyntax objects to OctetStr. Allow access as if it was an array. The given param is not checked for validity. Definition at line 210 of file octet.h. Allow access as if it was an array for const OctetStr objects. Definition at line 218 of file octet.h. Set the data on an already constructed OctetStr. The given string is copied to an internal member var, so the params can be destroyed afterwards. Set the output format for get_pritable_hex(). Definition at line 288 of file octet.h. Append or shorten the internal data buffer. The buffer will either be shortened or extended. In the second case zeroes are added to the end of the string. Set the character for linefeeds in get_printable() functions. Set the char get_printable_hex() and get_printable_clear() will use for non printable characters. Definition at line 295 of file octet.h. Definition at line 235 of file octet.h. Referenced by Pdu::get_context_name(), and Pdu::set_context_name(). Not equal operator for two OctetStr. Not equal operator for OctetStr and char string. Less than operator for OctetStr and char string. Less than operator for two OctetStr. Less than or equal operator for OctetStr and char string. Equal operator for two OctetStr. Equal operator for OctetStr and char string. Greater than operator for two OctetStr. Greater than operator for OctetStr and char string. Greater than or equal operator for two OctetStr. Greater than or equal operator for OctetStr and char string. Definition at line 376 of file octet.h. Definition at line 378 of file octet.h. Definition at line 368 of file octet.h. Definition at line 377 of file octet.h. Definition at line 366 of file octet.h. Definition at line 367 of file octet.h. Definition at line 371 of file octet.h. Definition at line 370 of file octet.h. Definition at line 369 of file octet.h. Definition at line 374 of file octet.h.